By absorbing half of the carbon dioxide emitted into the atmosphere, the oceans have a profound influence on climate. However, their ability to take up this carbon dioxide might be impaired as a result of climate change. To determine their response to global warming, ESA has backed two projects that provide systematic data on key oceanic variables – color and temperature. "Clues to climatic changes may already be written on the oceans’ surface. Because we now have detailed data that allow us to look for correlations, we are learning how to read those messages," said Prof. Ian Robinson at the National Oceanography Centre, Southampton (NOCS) and Medspiration Project Manager. "ESA is making a difference to public awareness of climate change by helping us to better understand the sea surface temperature story." 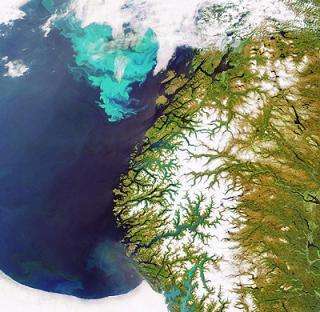 "Because phytoplankton are a major influence on the amount of carbon in the atmosphere and are sensitive to environmental changes, it is important to monitor and model them into calculations of future climate change," Prof. Emeritus Andre Morel at the French Observatoire Océanolgique de Villefranche explained. "The risk is that we may find the warming of the sea and the modification of the water circulation patterns may cut off or modify some of that primary production, so it is important to know both sea-surface temperature and ocean colour." In order to make the most of all satellite information available on ocean colour and sea-surface temperature, ESA is merging data from state-of-the-art instruments aboard different satellites. GlobCOLOUR uses data from colour sensors such as MERIS aboard ESA’s Envisat as well as MODIS carried aboard NASA’s Aqua and SeaWiFS aboard GeoEye's Orbview-2 satellite. Medspiration utilises data from ESA’s Envisat and Meteosat-8, the United States’ National Oceanic and Atmospheric Administration (NOAA) polar orbiters, the Japanese’s Space Agency-NASA Tropical Rainfall Measuring Mission and the AMSRE instrument onboard NASA's Aqua. The National Oceanographic Data Center (NODC), part of the United States’ National Oceanic and Atmospheric Administration (NOAA), is archiving these data sets to encourage data exchange and preserving them for long-term use. "People will be using these data 20, 50, and 100 years from now in ways that we can’t even imagine, so we need to do a lot of things today to ensure this irreplaceable information remains useful and understandable for decades to come," NODC’s Dr Ken Casey said.